While Pinot Noir has become almost grossly popular since the movie Sideways thrust it into the public eye, I’ve recently been exploring another varietal that is similar but (to me) more interesting: Nebbiolo. Nebbiolo is grown in Piedmont, Italy, and named for the principal villages in the region: Barolo, Barbaresco, Ghemme, and Gattinara. Like Pinot Noir, Nebbiolo is difficult to grow and cultivate into a drinkable wine, and Gattinara’s are similar in taste to California Pinot. And, some people say that Nebbiolo is Italy’s most noble red grape. Shoot me if I ever use the word noble to refer to a grape. The best Nebbiolo I’ve had has come from the Travaglini Winery, and it’s not just because the bottle is so cool. 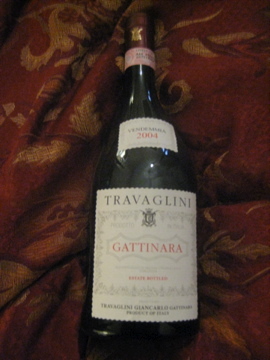 Travaglini Gattinara 2004 looks watery out of the bottle, a little thin in the glass. But it is full-bodied and tastes of red fruit- cherry and raspberry. Winemaker’s notes say that it also has hints of rose and violet, which I am not yet skilled enough to detect, but I will say I tasted some vanilla undertones. Wine Spectator gives this wine 90 points, which puts it in the “outstanding” category. There are a few well-regarded wine scales out there, most notably Robert Parker’s Wine Advocate Scale. This system ranks from 50 to 100 on color, appearance, aroma, flavor and overall quality. There is still some cache to drinking a wine Mr. Parker has blessed, but the truth is that if your tastes don’t match with his, the scale means nothing. Rankings from magazines like Wine Spectator and Wine Enthusiast can also be a helpful guidepost to quality, but there is always some question as to whether advertising dollars play a role in how well a wine is reviewed* by these publications. You can get some information about a wine on retail sites or Snooth.com, but many times the material on those sites is submitted by the public – the whole world is becoming one big Yelp. While it is helpful to get a layman’s opinion on certain things, it’s not always accurate information. Personally, I’ve been enjoying Wine Spider. Their mission is “to remove the mystery behind the numbers and allow mere mortals to participate and analyze the positive and negative qualities of a wine with confidence.” Sounds good to this mere mortal. While it doesn’t yet list the wide range of wines other sites have- Wine Spider is based on Australian wines- the site ranks nose, palate, and finish and also includes a “value for the money” rating that I appreciate. In the end, any ranking system is fairly useless unless you find something you enjoy drinking. Better, I think, to pick a wine shop and cultivate a relationship with someone there who can learn your specific tastes and give suggestions tailored to you. I’ve said it before and I’ll say it again, the best way to figure out what you like to drink, is to drink it. *Note, you can always be sure I am giving you my honest opinion since I currently receive zero dollars for anything I write on this blog.